“What’s this Imhotep place about?”, I asked my good friends Claudia and Mauricio as we left Belo Horizonte on our road trip to Rio de Janeiro, Brazil. 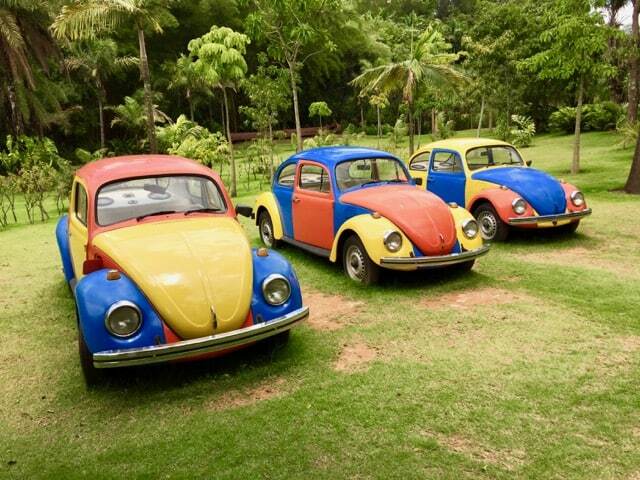 Claudia laughed and corrected me: “It’s Inhotim! And it’s a botanical garden and modern art museum in one”. I was intrigued. I enjoy strolls around botanical gardens and I’m a fan of contemporary art, so the combination of the two sounded great! 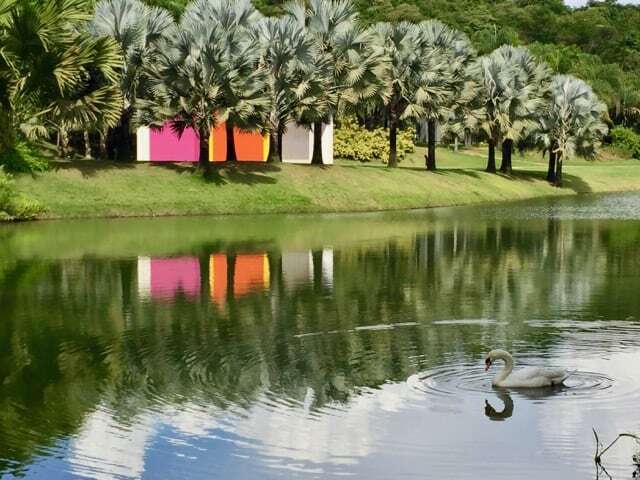 Inhotim (map) is an expansive park located at the edge of Brumadinho, a town about an hour’s drive from Belo Horizonte. 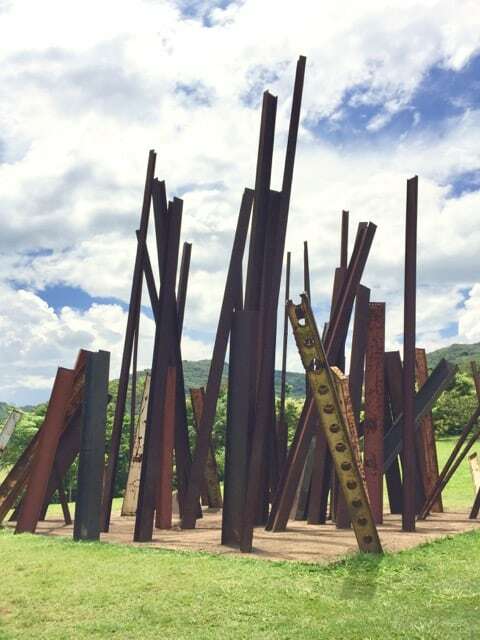 Conceived in 2002 and opened to the public in 2006, the park covers a sprawling 5,000 acres and is home to many varieties of flora interspersed by striking art galleries and pavilions. 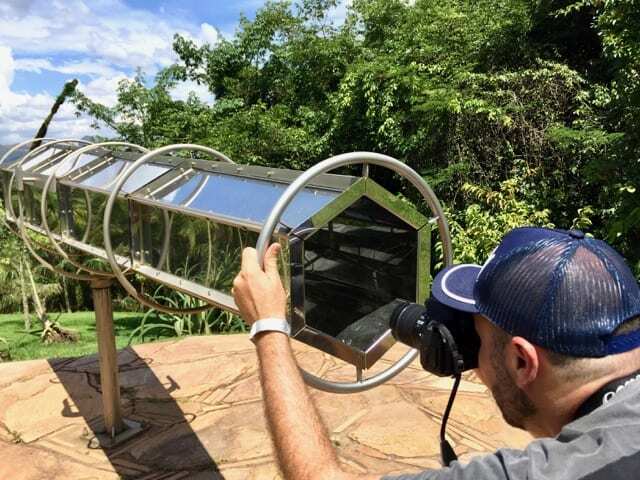 These days, Inhotim is home to more than 500 artworks by Brazilian and international artists, as well as more than 5,000 species of plants. The first thing I realised about Inhotim is how huge it is! From the main office, trails lead in different directions to all the corners of the park. The trails wind themselves around the undulating landscape of the park, making for easy walking (but you can also hire a buggy with a driver if you’re short on time). One of the trails that criss-cross the park. Together with Claudia and Mauricio, we explored the park at a leisurely pace. 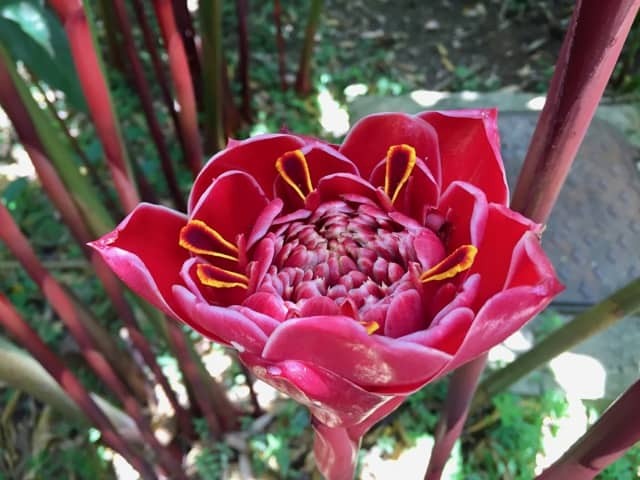 Wherever we went, we were continuously surrounded by gorgeous trees, palms and flowering shrubs. The landscape architects sure did an amazing job! 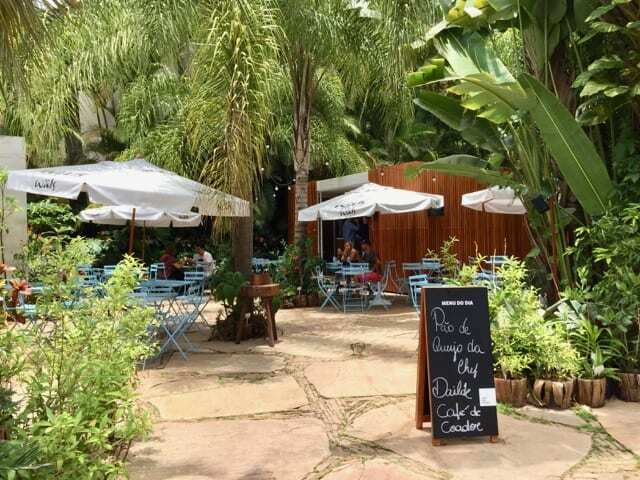 A café at the park entrance. There were many flowering plants and shrubs along the trails. We stopped at various pavilions to check out the art works. There were many fascinating specimens, from a hall filled with hammocks and colourful spotlights to candle-wax creations of famous buildings around the world slowly melting away as the candles burned. An intriguing piece by Edgard de Souza. 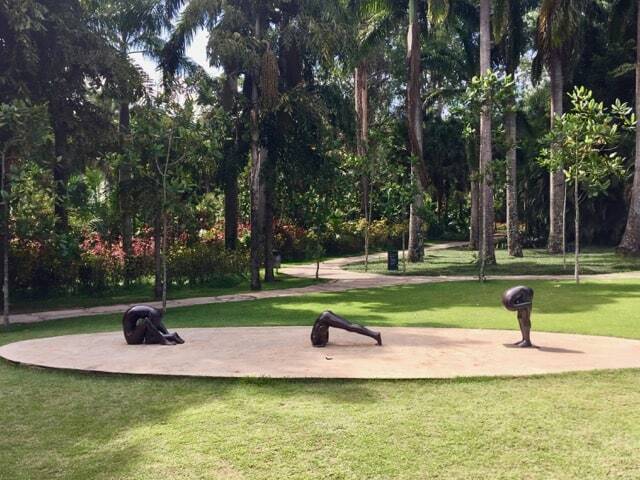 One of the art pavilions at Inhotim. For me, two pieces truly stood out: the moving kaleidoscope and the beam drop (beams were dropped 45m from a helicopter into a pit filled with concrete!). 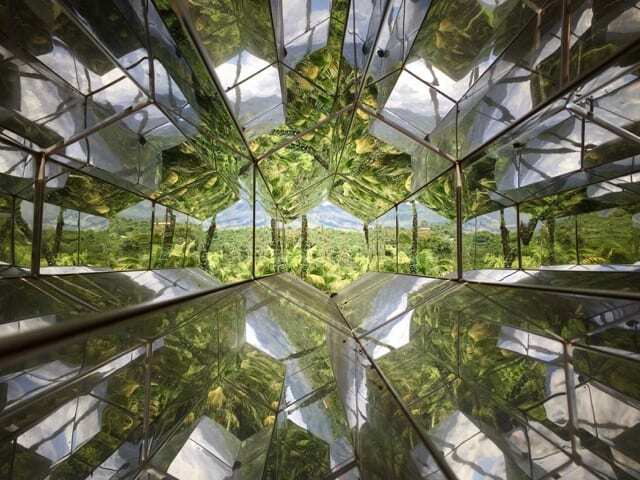 The stunning view inside the kaleidoscope. Along the way, I enjoyed the lush vegetation, and colourful birds and butterflies which flitted around. We ended our 4-hour walk with a meal at the park’s buffet restaurant, where you pay according to the weight of your plate. It was a lovely afternoon and we had a great time. 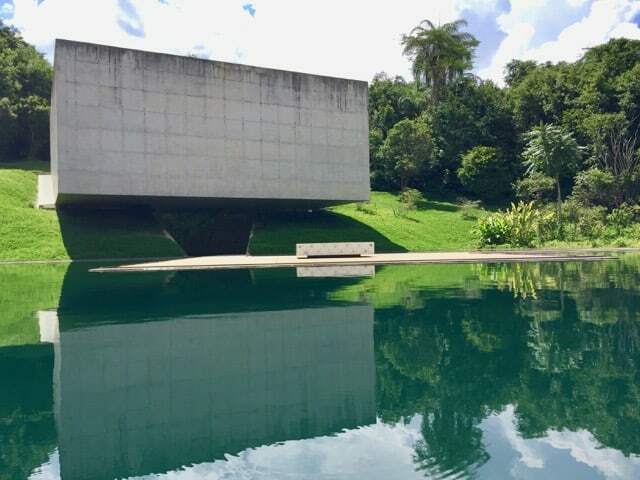 Check out my video of our afternoon at Inhotim. 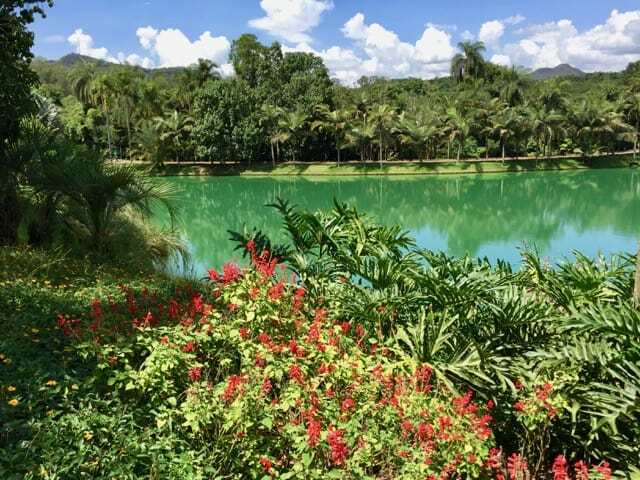 If you’re visiting Belo Horizonte, make sure to plan a half-day trip to Inhotim! For more information, please visit the website. That shot of the kaleidoscope is amazing! Great Photos and nice short description of the garden! Thank you for sharing this! 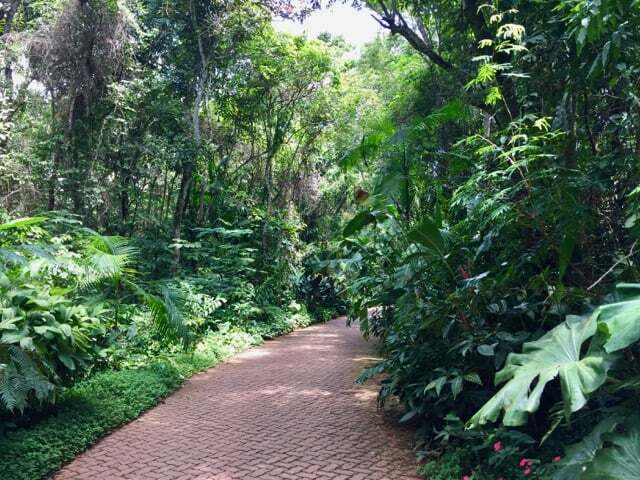 By the way, how much does it cost to enter or it’s free to stroll around Inhotim park? ?